Of, By & For Bengaluru: Support Our Heroes. Celebrate Their Spirit. "If trees were a poem, then a walk through Bangalore's street is sheer poetry." every inch of space a hub of mammon. The cover no longer green but vaporous. It's heart-wrenching to witness Namma Bengaluru plunge into total chaos - a chaos that has mercilessly murdered the city's soul. Haphazard growth, unplanned development and mal-governance has destroyed the very essence of this once proud 'garden city' of India. Are we staring at the end of Bengaluru? Is #BengaluruRIP going to be the last nail in the IT Hub's coffin? The possibilities are countless. But, all is not lost... yet! In a city of over 10 million and counting, there are innumerable men, women and children, who are striving hard to rescue Bengaluru from the clutches of... DEATH! They operate in shadows, away from the glare and glitz of fame and fortune, to silently fulfill their mission of making life in our city better. These spirited Bengalureans have selflessly devoted themselves to the society and yet they choose to remain faceless. Committed, courageous and resolute, they are simply unstoppable. It is this zeal, commitment, hard work and dedicated service - often beyond the call of duty - that can save Bengaluru! 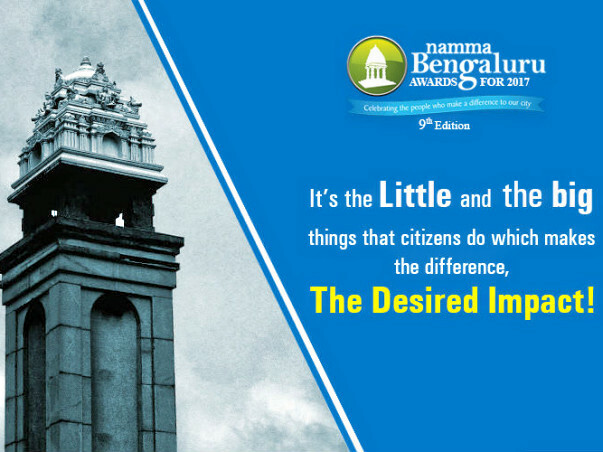 The Namma Bengaluru Awards is Namma Bengaluru Foundation's effort to recognize, honor and celebrate such outstanding individuals and their contribution towards making our city a better place to live in. These awards truly are the city’s way of saying ‘Thank You’ to its Real heroes. Over the last 8 years, every story has been an inspiration in its own way and has also enthused several other concerned citizens to work towards the betterment of our city, your city! This year taking this appreciation a step further, the Namma Bengaluru Awards 2017 hopes to raise an additional Rs 2 lakhs for each of our 6 winners. Your contribution will empower these real heroes to continue the good work they do. Shortlisted nominees for this year will be announced in the last week of February 2018 and the winners will be announced in March. Answer: It's better to light a candle than curse the darkness! Supporting those who do good for the society, is an integral part of being a good citizen. You may feel like a drop in the bucket. But, every drop counts! So, don't turn away, instead give today! About Namma Bengaluru Foundation: NBF is an organization working towards making Bengaluru a model city, with well-planned infrastructure, well laid out neighborhood community models and people-driven governance measures. NBF aims to be the voice of the people; a voice that needs to be heard in order for Bengaluru to become a truly Global City.